For Rahung Nasution, cooking Indonesian food is special. Behind every plate, there is different story of different region, packed with its long history. When we see he cooks, we can see how he loves every single spice used in the dish as it tells the story about roots of this nation. 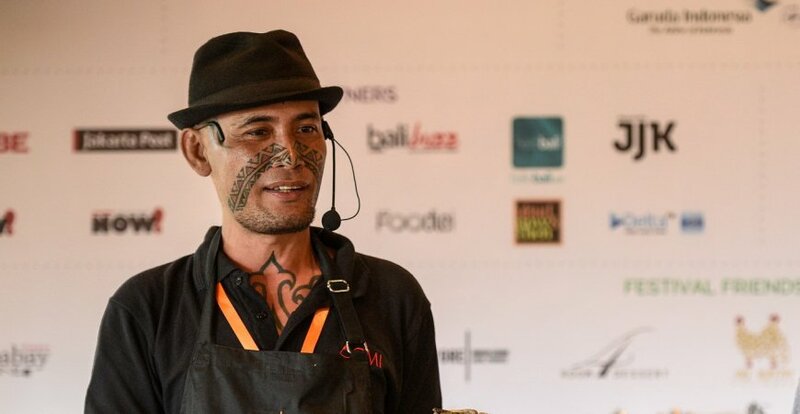 The man with Koita tribe of Papua tattoo on his face also falls in love with travelling. For him, travelling is not only about sightseeing, but also knowing about life of the locals. He can live for days in a local’s house, join the mother in the kitchen, and learn about their culture through food. He said that it also reminds him about his mother who lives in North Sumatera. He even nicknamed himself Pseudo-Chef, as his mother is the one true chef for him. This oldest of five siblings born and lived in Sayurmatinggi, Batang Angkola, North Sumatera learnt to cook at 13. As his parents have to work as farmers, he had to cook for his younger siblings. Rahung decided to begin his adventures when he is a teenager. He lived in Yogyakarta once, even stayed in Timor Leste for years. After all of his journey, his passion for cooking is never going out. He even went deep about food anthropology and it pretty much formed him as a cult food enthusiast. He may visited many countries, tasted many dishes, and learnt about their histories. Still, Bataknese cuisine, food of his hometown, surely has a special spot in his heart. What is the essential of Bataknese cuisine? Andaliman is the essential of Bataknese cuisine. Without andaliman, there will be no Bataknese cuisine at all. It is the key spice of Bataknese cuisine before they were influenced by other regions. Batak tribe used it to give heat to food before chili pepper came to Indonesia. Right now, Bataknese cuisine, especially from Mandailing regions like my hometown is influenced by many regions such as West Sumatera and Aceh. Thus, there comes many dishes involve coconut milk they never used before. In Medan, the food is influenced by Peranakan and Malay cuisine and garlic becomes the key spice as well while it is actually not a native spice of Indonesia. However, the assimilation of those cultures is what enriches the whole Bataknese cuisine. What is the icon of Bataknese food? Arsik and Bataknese sambal. They remain almost the same in every Batak region. What Bataknese food you often cook the most? Sambal tuktuk. It is a raw sambal made from dried fish and andaliman. I like the simplicity of this sambal, it is almost like sambal matah from Bali. If you have to choose, what dish you can eat every day? I love this dish for its richness. It requires more advanced cooking technique, healthy for its slow cooked technique, and demonstrates the complexity of flavour, especially its sourness. The usual thick arsik is very rich as you can taste the strong ginger torch flavour mixed with the spice and the freshness of the fish or seafood you use. You may also taste some similarity with tom yum when you taste arsik soup. However, the kind of acid elements used in this dish are actually very rich. We can use asam jungga from ginger torch’s fruit, asam kandis, and asam gelugur while tom yum only uses tamarind. Andaliman also adds the other dimension to arsik with its stingy heat and lemony aroma.